CIOs and CFOs need a sustainable path to cutting IT costs while maintaining the integrity of their mission-critical systems. The answer for many? Leverage remote managed services, like remote database administration to realize ROI and optimize operations. Also learn how Heineken USA utilizes remote DBA to realize ROI and true 24x7 database monitoring. Download Bluewolf’s newest insight now. In today's economic environment, businesses must operate at their most efficient level. 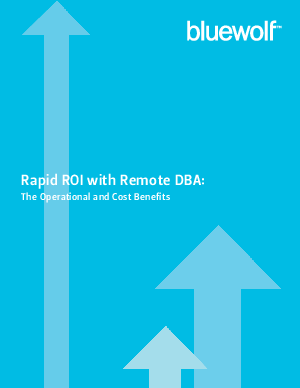 Find out how a remote DBA architecture can help your business achieve this goal today.